The Tacit Rainbow program originated in the early 1980s, and had the goal to develop an advanced low-cost anti-radiation missile with an extended loitering capability to search and attack enemy radar emitters over the battlefield. The development contract went to Northrop, and the first flight of a Tacit Rainbow vehicle occurred in July 1984. The program was initially highly classified, and it took until early 1987 that its very existence was revealed. At the same time, the Tacit Rainbow missile was designated as AGM-136A. The designations ATM-136A and DATM-136A were assigned to flying and non-flying inert training missiles, and a projected ground-launched variant for the U.S. Army (for use from MLRS (Multiple Launch Rocket System) launchers) was designated BGM-136B. The AGM-136A was a UAV powered by a Williams F121 turbofan engine. The missile was equipped with flip-out flying surfaces, and could be carried externally by fighters or internally by the B-52. After launch, the vehicle proceeded on a preprogrammed course towards the general target area, where it would loiter and seek for radar emissions of enemy air-defense systems. Once a radar had been detected and identified as non-friendly, the AGM-136A would dive on it and destroy it with its 18 kg (40 lb) WDU-30/B blast-fragmentation warhead. It was planned to use swarms of Tacit Rainbow missiles to fly ahead of a strike to take out as many air-defense radars as possible before the manned aircraft would arrive. By 1987, the Tacit Rainbow had suffered from severe cost overruns, mainly because of problems with the development of the missile's seeker software. For a short period, the CGM-121B Seek Spinner was evaluated as a cheaper alternative, but that program was terminated in 1989. 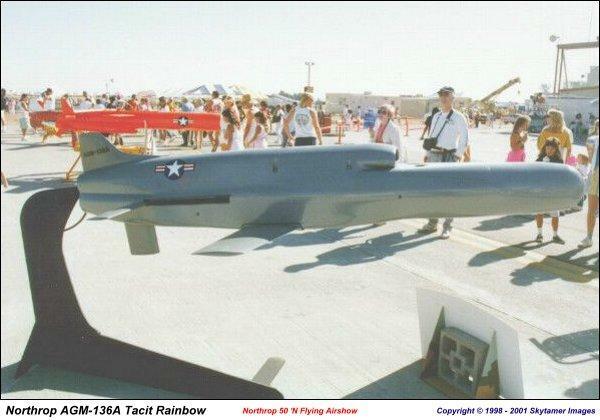 Although the USAF had planned to start production of the AGM-136A in 1992, the Tacit Rainbow program was finally cancelled for budget reasons in 1991.